Young goat herders in Terekeka County, South Sudan, prepare to drink dam water through pipe filters provided by The Carter Center in its efforts to eradicate Guinea worm. Jimmy Carter describes the first time he saw a person with Guinea worm. When President Jimmy Carter publicly disclosed his cancer diagnosis in August 2016, he also brought up some unfinished business. 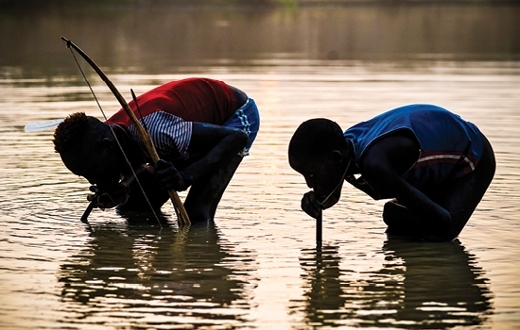 "I'd like the last Guinea worm to die before I do," he said. The former president was referring to a parasitic worm that grows inside the human body for up to a year until it finally emerges through a painful blister. Since the worm, contracted by drinking contaminated stagnant water, has for centuries afflicted only the poorest of the poor in the world's most remote locations, governments and health organizations largely ignored it. That changed in 1986 when President Carter took a trip to a small village in Ghana. Among the many villagers afflicted with Guinea worm, he saw a lovely young woman holding a baby in her arms and went over to coo at the child. Upon closer look, he realized she was holding not a baby but her swollen, painful breast, from which a long, thin white worm was emerging. He decided then to make the eradication of Guinea worm disease a mission of The Carter Center. This mission is nearly accomplished. When President Carter took up the fight, there were an estimated 3.5 million cases a year in 21 endemic countries. Last year, only 22 people in four countries suffered from the "fiery serpent." And as of April 1, there was only one known case of Guinea worm in the world. More cases could certainly emerge in the coming year. Even so, it's only a matter of time before Guinea worm goes the way of smallpox. And when it does, it will be the first parasitic disease, and perhaps the second human disease in history, to be eradicated. "Eradication will be an extraordinary accomplishment," says William Foege, who is credited with devising the strategy that led to smallpox eradication while he was director of the Centers for Disease Control and Prevention. He is currently senior fellow of health policy at The Carter Center and Presidential Distinguished Professor of Global Health, emeritus at the Rollins School of Public Health. "Africa provided every barrier that can be imagined, and lesser people would have accepted dramatic declines and called it a success. The Carter Center was striving for perfection so that no one would have to suffer from this disease again. Soon Guinea worm disease will pass from being a plague that returned to villages year after year for centuries to being a tale passed from generation to generation." The feat will be all the more extraordinary because it will have been accomplished with no treatment, no vaccine, no acquired immunity, and no cure. The only tool—convincing deeply traditional people in remote regions of the world to change the way they have collected and consumed water for generations. 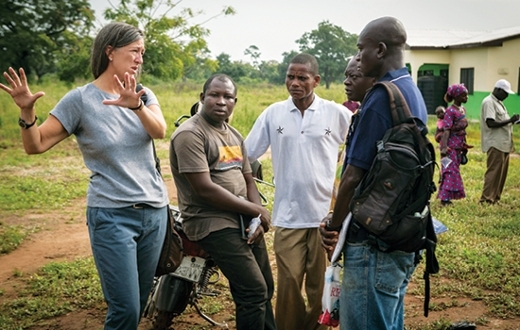 "Look at how hard it is to convince people in the United States to quit smoking or eating super-sized meals at McDonald's," says Kelly Callahan 09MPH, one of scores of Rollins alumni who have played key roles in The Carter Center's Guinea worm eradication program. "Behavior change is hard in the best of circumstances, and with Guinea worm, we're not dealing with the best of circumstances." Kelly Callahan 09MPH trains volunteers in southern Sudan in 2000. Photo by the Carter Center. A person contracts Guinea worm from drinking stagnant water contaminated with microscopic freshwater crustaceans called copepods that are infected with Guinea worm larvae. Once inside the stomach, the copepod breaks down and releases the larvae, which mature and roam inside the abdomen until they find a mate. The male dies and the female continues to grow—reaching lengths of two to three feet. Nine to 12 months later, the worm finally emerges though an excrutiating, burning blister. In fact, the disease is also known as dracunculiasis, or "affliction with little dragons," because the worm feels like tiny, hot daggers poking through skin. Immersing the wound in water soothes the burn and also causes the worm to release hundreds of thousands of larvae. The cycle begins anew. The treatment is the same as it has been for thousands of years. The worm must be pulled gently from the wound, centimeter by centimeter, and wound around a twig or piece of gauze. The process is agonizingly slow, requiring anywhere from a few days to a month or more to tug the worm free. Breaking an emerging worm will cause it to pull back into the body, where it will die, calcify, and possibly cause deformities or crippling. Compounding their toll, worms typically emerge during the agricultural season in sub-Saharan Africa. That means the fortunes of a struggling family can be decimated by a white worm the width of a spaghetti noodle. "I have seen villages of 3,000 people in which all of the productive workers either had Guinea worm or were taking care of someone who did," says Callahan, who is now the director of The Carter Center's trachoma control program. "They could not plant their crops. Children couldn't go to school. It devastated the entire village." Those days are gone, thanks to the low-tech, boots-on-the-ground efforts led by Carter Center professionals, many of them Rollins alumni. Jamine Peterson 07MPH worked in South Sudan from 2011 to 2014. Living in a large canvas tent on a spot of land donated by a local chief, Peterson recruited and oversaw a staff of more than 30 local field officers and at least 500 village volunteers. From her rudimentary hub with a hand-dug latrine, Peterson would trek via truck, motorbike, and foot to ever more remote villages. At each stop, she and her field officer used stories, skits, and songs to educate the residents about Guinea worm disease, how it spreads, and how to prevent it by using simple cloth water filters. They searched out any locals who showed signs of an imminent worm or an emergent one, and then tried to convince them to go to a containment center or, at the very least, to stay out of the local water source. If they were too late to prevent contamination, they would treat the water source with a larvicide. The first defense against contracting the disease is filtering the water. Callahan and other Carter Center colleagues fashioned and distributed filters to attach to the top of water barrels. Then the women who collected the water and carried it in containers balanced atop their heads could pour it directly into the barrels, filtering out the larvae-infected copepods. In areas where household filters were not feasible because residents had either been displaced by civil conflict or were nomadic, The Carter Center borrowed the idea for a portable straw filter from nomads in West Africa. During her time in South Sudan, Callahan was part of an effort that employed more than 1,300 Sudanese refugees in Kenya to assemble more than 9 million personal pipe filters and distribute them all within a six-month period. "At the time, it was the largest public health intervention that had ever taken place," says Callahan.